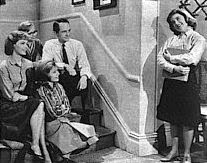 In the mid 1960's there was a popular TV show geared to teens called The Patty Duke Show. Often one of the popular rock artists of the day would make an appearance on the show. One of member of a long forgotten group had a guitarist that played a very unusual looking 12 string guitar. I had no clue what type of guitar this was until years later when I discovered it was made by The Danelecto Company of Neptune, New Jersey and was called The Bellzouki. This guitar was based on an idea from Vinnie Bell. Bell was an in demand studio player in the 1960's. He had wonderful career and played with a myriad of artists and on literally hundreds of hit songs of all styles. In fact he still makes a living as a guitar player and you can hear his guitar in The Family Guy theme. One of the more recognizable songs he did was the watery guitar work on the theme to Midnight Cowboy. Check out his website for some great stories. 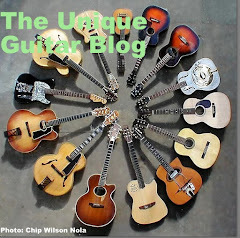 Be sure to click on Memories and Above and Beyond the work of a session guitarist. Though Bell is Italian, he was periodically asked to double on the Greek Bouzouki for a record. 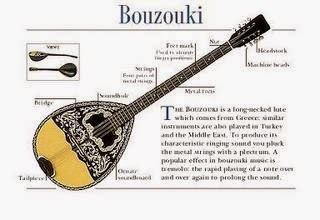 A bouzouki is generally thought of as an eight string musical instrument that is shaped somewhat like a bowl back mandolin with an extended neck. It has four courses of strings tuned in unison and is played with a plectrum aka pick. 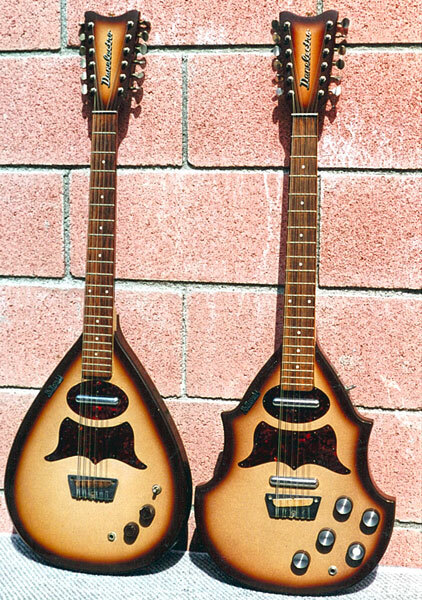 The bouzouki is widely used in Greek and Turkish music. The eight string version is called a Tetrachord and is tuned in fifths just like a mandolin. The six string version has 3 courses of strings tuned in unison. This is call the Trichord Bouzouki. Around 1960, several groups from Ireland that played traditional music of that country started using a version of the tetrachord bouzouki. However the body was flat and smaller than the Greek/Turkish models and the back was also flat. The tuning was modifed. As most studio players were apt to do, Bell would tune the Bouzouki like a guitar. 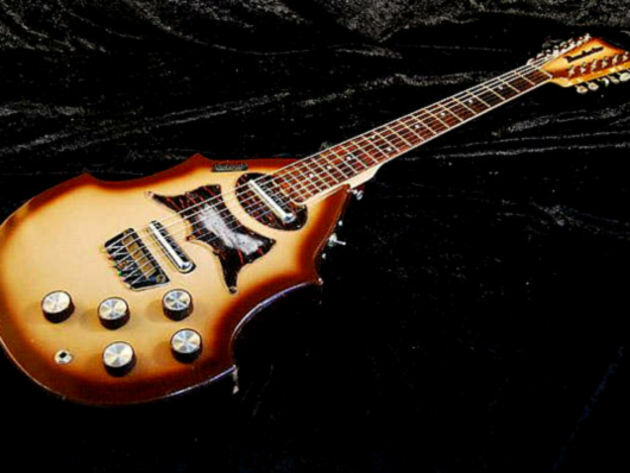 As the age of the electric 12 string guitar ushered in, Bell got the idea to create a twelve string electric guitar, and make the body look similar to the shape of a Bouzouki and electrify the instrument by adding a pickups. 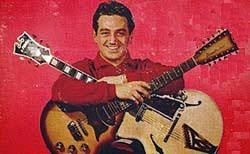 He already had a deal with the Danelectro company which created an all wood electric guitar that he would endorse. He pitched this idea to Danelectro, drew up some plans and named it after himself. 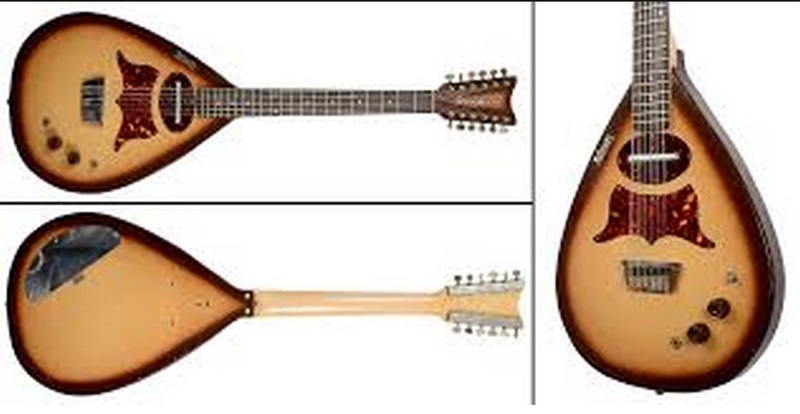 Thus the Bell-Bouzouki was born and known as the Bellzouki. 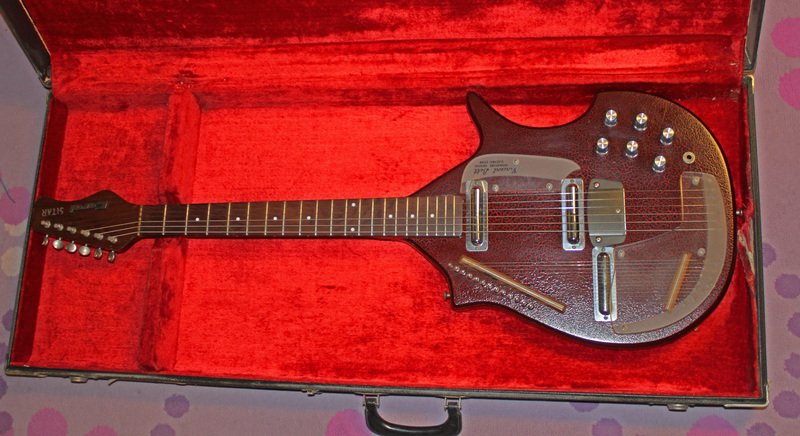 The Danelectro Bellzouki Model 7010 was introduced around 1961. 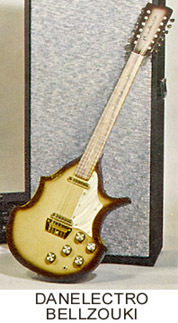 The body was tear drop shaped with two faux tortoise shell pickguards. The guitar came with one volume and one tone control, plus a 3 way toggle for tone selection. The neck, like all Danelectros, is a bolt on style and is made of maple capped with a rosewood fretboard. The nut is aluminum and the neck is reinforced with a steel truss rod. Though the body appears to be solid, like all Danos it is a poplar frame covered with Masonite. The sunburst finish adds the illusion of wood. To play the model 7010 you needed a shoulder strap due to its Bouzouki-like shape. 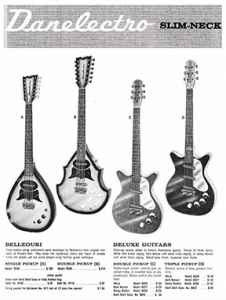 The scale for each of the Bellzouki models was 24 ½ inches and the neck was slightly wider than the neck on six string Danelectro guitars. All the models had one or two Lipstick pickups which have their own unique sound and these guitars were no exception to that quality. The earliest models came with 2 unison G strings to give it more of a Bazouki sound. Later these were adapted so only the first and second strings were tuned in unison, while the bottom four courses were tuned in octaves. Danelectro came out with two revised models, the 7020 and the 7021. The model 7020 may have been due to a suggestion of a fan of Mr. Bell to improve his design. The model 7020 had a similar shape to the original tear drop, but 4 notches surround the body to make it possible to play the guitar while sitting. The toggle switch was moved from the top of the instrument to the lower side. This model came with twin lipstick pickups and five potentiometers for volume, tone and master. The model 7021 was much like the 7020 in accouterments but its body shape was exactly like the Danelectro Electric Sitars body. 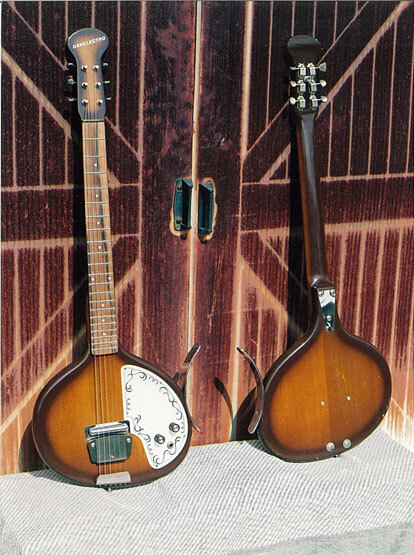 The Danelectro sitar that came with 18 strings and was another one of Vinnie Bell inventions. (There was another version of the Danelectro sitar with an oval shape and only six strings.) Most 1960’s groups favored more expensive model 12 string guitars, but the Danelectro 12 had been around much longer, it was an excellent player and a great bargain. I still have my 7020 66 Bellzouki all stock. It even has the foil sticker on the back.The pick guard is wiggle picture pearl. If I get a good offer I might sell it. I never had a case. It came shipped in a cardboard box and packing foam. I've had it 45 years. Ripstop - what would you consider a "good" offer? Can you send me some pics of it? Have the 7010 teardrop model. Well worn, but once in tune, it still sounds great. Love the Danos!!!! Just one correction, though: Danelectro necks were made of poplar (not maple). I checked and mine is a 2021 double pickup and white shimmer pick guard with the Coral Sitar shaped body sorry. Still have the 7021 and the only thing not stock is a broken string which I removed. Everything else is out of the box when I bought it. It was played for a few months and put away. That was in either 66 or 69. I was out of the country for 2 1/2 years and the band fell apart during that time.In 69 the army took me and it went into storage.Still sounds good. Hey Ripstop, do you still have your Bellzouki and is it still for sale? I'm looking for a sweet looking 12 string for my rock 'n roll band and I really dig the Bellzouki. Let me know at etienne.barry@gmail.com. Thanks! - The "tetrachord" Greek Bouzouki has four courses, but only two are in unison, the treble ones; the bass ones are in octaves. Also, the traditional tuning is CFAD (not in fifths! ), like the first 4 courses on a Rick 12-string guitar (bass-string first: Cc Ff aa dd), but a whole tone down. - The "trichord" Greek Bouzouki is traditionally tuned DAD (Dd aa dd), a modal-type tuning for older greek folk music based on modes and drones. - Although the Greek Bouzouki is played in some areas in Turkey, the country's most popular instrument is the Bağlama/Saz, a related instrument. Barkersmusic.com in Modesto Ca has one. I am tring to decide what to do with it? @Kelly Barker, I’m still looking for a Bellzouki for my r’n’r band after all these years. I’d for sure be interested if the price is reasonable. Would you consider shipping it? If you could send me a couple photos so I can see what it looks like at etienne.barry@gmail.com that’d be great! "Tetrachord" and "Trichord" should be spelled "Tetrachordo" and "Trichordo"